It's Africa hot out there currently and that's going to be the theme for the next several days until cooler weather sets in for the weekend. All of our local trout streams are extremely low and warm, so look to warm water venues to focus your fishing over the next few days. As I was discussing with a local angler yesterday, we're at the turning point of the season where we tend to move our interests from cold water to warm water fishing. We've been doing just that and having mixed success. We've been finding water temps on the lakes that we have been fishing between 68-72 on the surface and that will be warming up this week. Early morning poppin' for bass has been good until the sun comes up and sends the fish deeper. For smallie fishing, I like a 9', 3x mono leader. If you're fishing largemouth or in thick cover, you can go with a heavier leader to help pull those fish out of the weeds. I've never felt undergunned fishing 3x for smallies though. 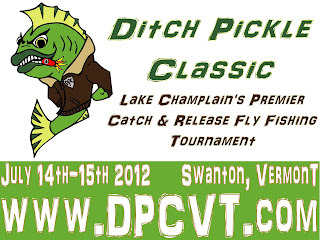 Speaking of bass fishing, don't miss the 2012 Ditch Pickle Classic on Lake Champlain July 14th & 15th! We've already got 20 teams signed up, all looking for their shot at the trophy! For info and registration, simply send an email to ditchpickleclassic@gmail.com and we'll get you all the info you need! 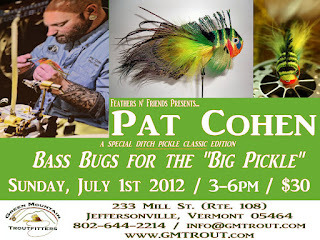 n' Friends featuring Pat Cohen and his insane talent for spinning deer hair. Pat will be leading a lesson at our shop from 3-6pm on Sunday the 1st. Afterwords we'll be hosting a BBQ, so reserve yourself a spot and get yourself down here on the 1st!